Of McLean, passed away on January 28, 2019. He was born in Trenton and graduated from the University of Miami. He became executive producer at CBS News, later winning a Grammy Award for his work on Edward R. Murrow [JB -- see] "A Reporter Remembers." Later, he was recruited by the Nixon White House to run TV operations after which he became a news executive at WMAQ-Chicago where he garnered 11 Emmy Awards. He returned to Washington as Director of TV & Film at the USIA [JB - see]. 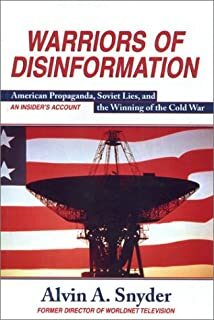 As an Annenberg Senior Fellow, his book on the use of propaganda by the U.S. Government, "Warriors of Disinformation," was published in 1996. He later became a Senior Fellow for the USC Center on Public Diplomacy [JB emphasis]. He is survived by his wife of 57 years Anne Glassman Snyder; daughter Carole Heller; son James, and four grandchildren. Funeral service will be held at Temple Rodef Shalom, 2100 Westmoreland St. Falls Church, VA 22043 on Monday, February, 4 at 10 a.m. Interment following at King David Memorial Gardens. Shiva to be observed at the home of Anne Snyder at 7 p.m. Donations may be made to Indiana University School of Medicine, IU Foundation for Genetic Research of Alzheimer's or the University Of Miami School Of Communications.